I’m not a big fan of 3rd party Leica “accessories.” I can only think of a few that were worth the expense – the Abrahamsson Rapid Winder, and the Amedeo Nikkor Rf to Leica M lens adaptor both come to mind. After that, not much else. The Rapid Winder fills a niche left ignored by Leitz – a decent trigger winder for your M2/3. The Amedeo adaptor offers you the ability to use some awesome 50mm Nikkor RF lenses on your M with rangefinder coupling. Both are exceptionally well-engineered and constructed items, as good, or maybe even better, than what Leica could have done had they the desire. So, recently, when I received an email from someone in Germany offering me a free “Scarabaeus” holster for carrying around my Leica, free of course with the hope that I’d pimp it on Leicaphilia, I said, sure, why not? Free is good. Send it my way. Just don’t expect a glowing review, or any review at all, for that matter. What I didn’t tell him was that I’d seen the Scarabaeus holster before and thought it was potentially a great idea, great if done properly. I’ve always disliked camera straps and rarely use them, which leaves me using a camera bag, which brings with it its own set of problems. So I’ve often ended up using a pouch, sized to fit a body with lens, attached via a clip to my belt. It works but has its own drawbacks – it looks unwieldy (certainly not “elegant and stylish”), and constantly getting the camera in and out of the pouch can be annoying.There should be a better way. So, after having used my absolutely free Scarabaeus holster for a few days now, I can confidently say that it’s a great idea executed simply and elegantly. It works. It works really well, actually. The holster itself consists of a mounting plate attached via a hinge to a belt clip. Your camera connects to the mounting plate via an inconspicuous bottom plate you attach to your camera’s tripod socket. Clip the holster on your belt, swing the mounting plate open, attach the camera to the plate and, voila!, your M is now firmly attached to your waist, sitting snug at your side, ready to use. And the beauty of the holster is that it’s super easy to attach and remove the camera from the holster – clearly someone with some engineering experience thought this one through. It’s all very intuitive: grab the camera with your dominant hand, reach over with your other hand and pull up an easily accessed lock/unlock mechanism and your camera is free of the holster and ready to use. When you want to reattach it, simply unlock the holster and slide the camera bottom back onto the holster and lock. You can pretty much do it without looking. As for the build quality of the holster, it’s robust and heavy, solid and over-engineered, exactly what you’d expect of something you’re trusting your expensive Leica to. Is it “elegant and stylish”? That’s a subjective valuation, of course. It certainly is elegant to the extent that it’s functional and is so in an obviously simple way. 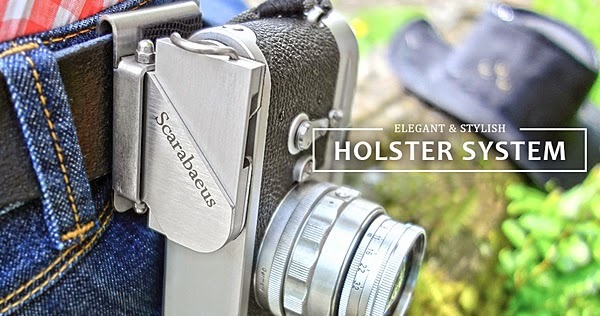 You can take a further look at the Scarabaeus Holster system at http://www.photoscarab.de/. They start at $149. which is serious money for a belt clip. However, overbuilt and engineered as it is, all metal, no plastic, my sense is it’ll last forever. This entry was posted in gratuitous Leica Swag and tagged Scarabaeus Holster on June 14, 2017 by Leicaphila. I think this is the first time I have ever purchased something because of an online review. I received my Scarabaeus this week, and have been using it. I thought I would start small, so I hung a IIIf with a collapsible Summitar mounted. As with my usual practice, I also put a SBOOI finder on it. Several long photo walks followed. My take is that it’s handy and secure, much less annoying even than the small strap I usually use. Is it worth the $149? Well, it is undoubtedly well-made of solid materials, and admirably precise and secure in feel. So far, yes, I would say it is worth it. Provided it holds up to use over time, I will be quite happy with it.